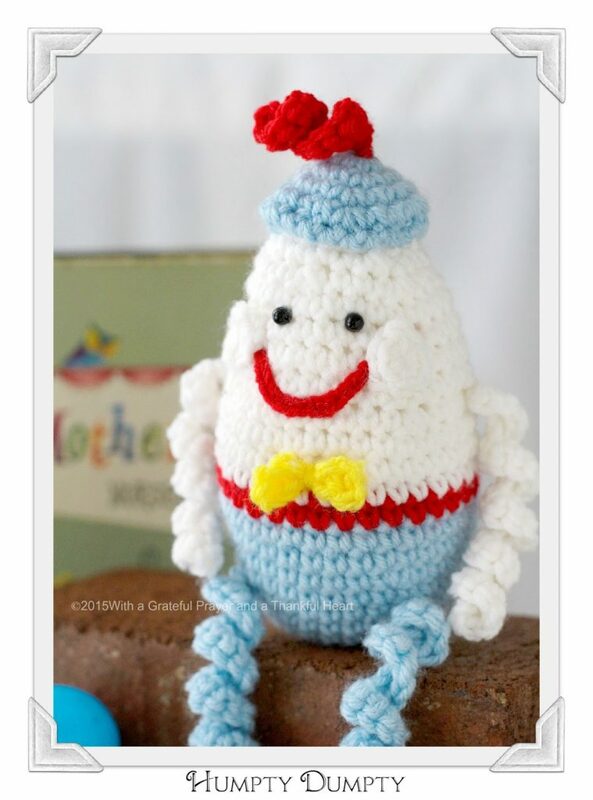 This happy little Crochet Humpty Dumpty Egg is made using a modified version of my Easter Egg pattern. 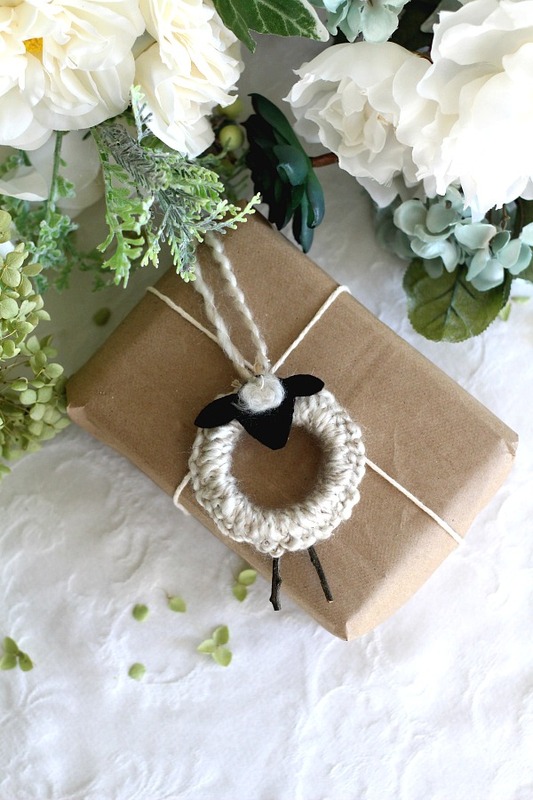 He certainly doesn’t fit in to an Easter decorating theme, but he does make a cute baby toy, baby shower decoration or gift topper. NOTE: When working in rounds, I mark the end of each round with a piece of contrasting yarn and move it as I complete each round. Rnd 16: sc in each sc around decreasing in every 10th sc (30 sc)Begin stuffing your egg. You will need to add more at the end but I think you can get a better shape if you begin at this point. Rnd 17: Work even (30 sc). Rnd 21: Sc in each around decreasing every 4th sc (20 sc). Continue stuffing your egg. Rnd 24: Sc in each sc around, decreasing every other stitch for two rounds till closed. Break off. Ch 3, join wit sl st to form ring. Rnd 1: work 7 sc in ring. sl st in next sc and tie off. Ch 6, 1 sc in second st from hook and each across (5 sc) Sinch in center with matching yarn when sewing to the body. Sew on beads for eyes or embroider French Knots for the eyes. MOUTH: Using a small piece of red yarn, chain about 11. Using thread and needle, stitch into place. Sew arms and legs onto the body. Sew on small yellow bow. Lightly stuff hat and sew on at a slight angle. Attach red squiggly to top of hat. CAUTION: if making as a toy, be certain the eyes and small pieces are securely attached. So cute! My dear, little mother tells me when I was very young I called him 'Dumpty Egg'! 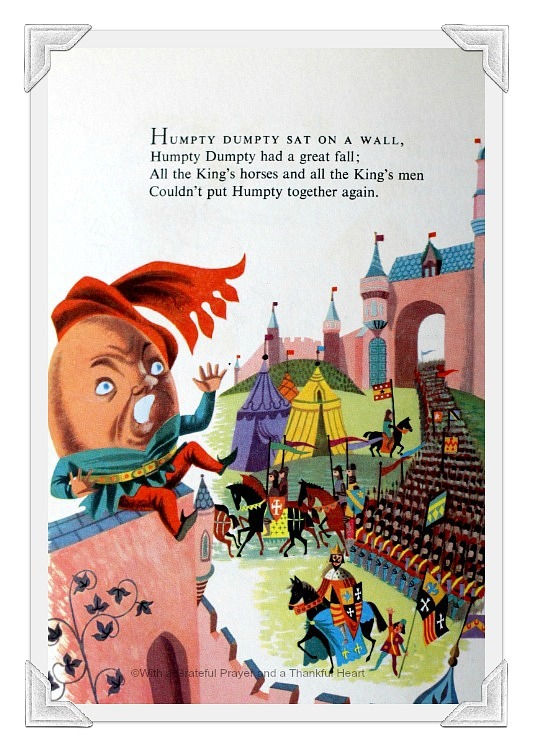 I like your Dumpty Egg! 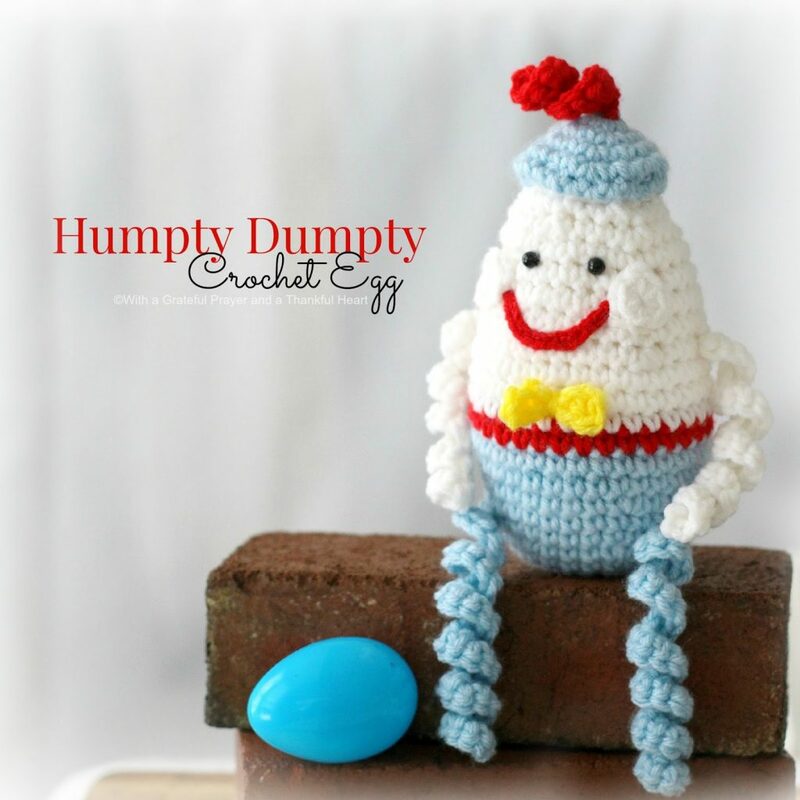 Many years ago someone gave my new baby a humpty dumpty made of fabric and it was one of his favorite toys. I think this would make many a baby happy, especially with the happy face ! Bright and cute! And clever. Aww, he is so cute!! :) Thanks for sharing!! This is so sweet Lorraine! So cute…thanks for the pattern. Adorable! I love the illustration in your childhood book too.